Our company is among the most sought after offering Tablet Cutter to the clients. This product can be availed through us in various specifications depending upon the client’s requirements. Tablet Cutter is made at the well-equipped manufacturing unit under the supervision of highly experienced professionals. - Generally doctors will prescribe half tablets for patients. You can cut two half tablet or quarter tablet in this device. - This product is made of rust proof special quality magnet steel blade. Our company is highly esteemed in providing Tablet Cutter. To grind pills into powder. Suitable for those who are unable to swallow pills. 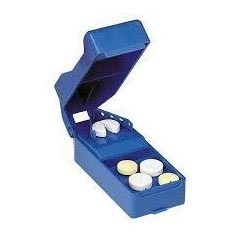 With pill carrying compartments. - High Quality Product with stainless steel blade. 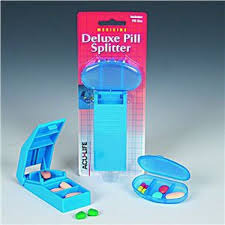 Backed by huge industry experience and market understanding, we are involved in offering a wide array of Medicine Tablet Cutters for our valued patrons. In order to meet the various requirements of the customers, we are engaged in offering a wide assortment of Tablet Cutter. Storage space in the base to keep medications. Cut pills and medications with ease. Super lightweight for travel convenience.